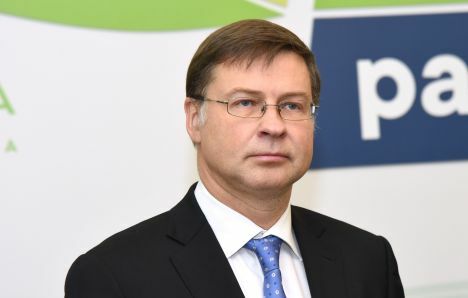 Population will not significantly feel the impact of a slower growth of the European Union economy in 2019 and 2020, but people should prepare for stagnation, as economy is by its nature cyclical, European Commission Vice President Valdis Dombrovskis to LTV programme Rīta Panorāma. In an interview with the Rīta Panorāma news programme on Thursday, February 7, Dombrovskis, who is also a former long-time head of the Latvian government, evaluated that the driving forces of the EU are currently local demand, which stems from positive results of the labour market, lower unemployment and rising wages. Addressing the widespread concerns over the effects of Brexit, the EC Vice President predicted that the withdrawal of the United Kingdom from the EU would have a negative effect on the EU economy both in case of an orderly Brexit with a deal or in case of a no-deal withdrawal, but the damage done on the side of the EU would not be significant. The UK should be more worried as its economy is slowing already, Dombrovskis believes. Dombrovskis, who is also a former Latvian Finance Minister, acknowledged that Latvia is taking the recommendations of Moneyval into account in strengthening the oversight of banks in the Baltic country. For example, the Office for Prevention of Laundering of Proceeds Derived from Criminal Activity has seen the strengthening of its capabilities, banks in Latvia have reduced the percentage of non-resident clients. The solving the problems identified by Moneyval are also a priority of the current government of Latvia, explained Dombrovskis.